The Wentworth Mansion, built in 1886 as a private residence for the wealthy cotton merchant Francis Silas Rodgers, invites guests to enjoy the preserved opulence of America’s Gilded Age. The inn’s 21 guestrooms and suites feature antique furnishings, carved marble fireplaces, and oversized whirlpool tubs. The Mansion is located in Historic Downtown Charleston; antique and specialty shops, historic attractions and art galleries are within walking distance. 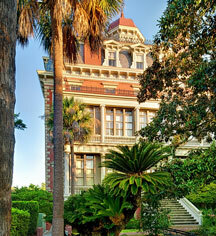 Wentworth Mansion, a member of Historic Hotels of America since 2003, dates back to 1886. 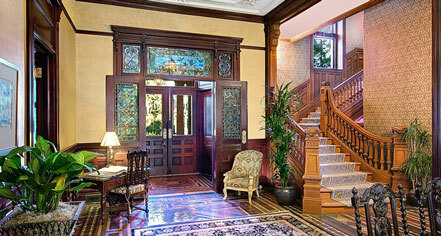 Materials, artisans and craftsmen from Europe were imported to create the mansion's exquisite detailing. Accessible Rooms: One (1) accessible room is available. Please notify request at time of booking. Cancellation Policy: Cancellations must be made 7 days prior to scheduled arrival. Guests who do not cancel within this time will be charged for a one-night stay with tax. Deposit: First night's deposit including 13.5% tax is required at the time of reservation. Early Check-In/Late Check-Out: Available, depending upon availability. An early departure may result in a penalty. Extra Person Fees: For more than two guests in a room there is a $50 charge per night for each additional guest. There is no charge for children 12 years of age and under. Hotel/Resort Fees & Taxes: All reservations are subject to a City/State Tax of 13.5%. Occupancy Restrictions: 2-3 people depending upon room type. Pet Policy: Service animals allowed: Yes. Pets allowed: Yes. Restrictions: Dog Friendly. Fees: $25 per night. Other: Pet reservations must be made directly through hotel; Garden rooms only. Pet package available. Smoking Policy: Non-smoking property. $300 smoking in room fine. The Wentworth Mansion, built in 1886 as a private residence for the wealthy cotton merchant Francis Silas Rodgers, invites guests to enjoy the preserved opulence of America’s Gilded Age. The inn’s 21 guestrooms and suites feature antique furnishings, carved marble fireplaces, and oversized whirlpool tubs. Learn more about the History of Wentworth Mansion .